If you’re into bodyweight training (aka calisthenics), or you’re looking to get into it, then you can do it without buying equipment. The floor and the power of your own muscles is all you need for a good basic bodyweight routine; it’s that simple. However, if you want to progress to higher levels and do more advanced routines, then you’re going to need some good equipment. And there are few pieces of equipment that match the versatility and overall usefulness of a power tower (sometimes called a pull up and dip stand). Gains in strength, explosiveness and muscle mass are on offer for those who do consistent and effortful workouts on a good power tower. But that’s the thing: Not all power towers are created equal, and they’re certainly not all good. There are also heaps of options on the market, and without physically trying each one, it’s hard to know which tower will be a good investment, and which will be a poor one. So we’re here to help. Welcome to our review of the best power towers (pull up & dip stands) currently on offer. In this article, we’ll take a look at, and recommend, the best and most cost effective equipment you can use to make the most of your bodyweight workouts. This is an extremely heavy duty power tower. Yes, it’s going to cost you a pretty penny, but if you’re after the best overall piece of equipment, then this is it. Unlike cheaper power towers, this thing won’t wobble or shake at all during workouts, meaning you can go about your business without distraction. Also, it’ll last for as long as you care to keep it. As we said earlier, not all power towers are created equal. Some, like the Xmark XM-7617 above, are made from very high-quality, heavy duty materials, and they tend to be the best power towers overall. But, they’re also quite expensive (i.e., no less than $300 and usually closer to $500) and are not right for everyone. Most other towers are made from lower quality materials, and while they’re usually much less expensive (i.e., less than $300), they also tend to be less functional. That said, there are some great low-cost power towers out there, which are what we call the best power towers for the money. All of these power towers are great value, and will be perfect for you if you’re looking to get a regular, good quality calisthenics workout. And we say ‘regular’ deliberately; they’re not suitable for really advanced bodyweight movements (e.g., muscle ups and back levers), explosive movements (e.g., kipping pull ups / crossfit pull ups) or weighted exercises (e.g., weighted dips). The reason for this is that they lack the necessary stability for these kinds of uses. These power towers are designed and constructed for home use. That means that they need to be light enough to box and ship to people’s homes, and for people to be able to carry them into their workout space and assemble them. But this comes with a trade off in stability. Less weight always equals less stability. Why is it number 1? 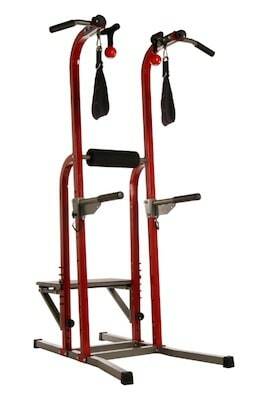 The Bowflex Body Tower takes the number one spot because of it’s versatility. The range of exercise you can do on this bad boy simply blows the other power towers out of the water. It’s perhaps the only tower on the market that has legitimate options for leg exercises, meaning you can truly get a full body calisthenics workout with just the one piece of equipment. Not bad, right? The included handle attachments also allow for good quality inverted rows, which is another standout feature. Heavy steel frame – It should last as long as you have it, and withstand whatever you can throw at it. Low center of gravity – It’s short. Standing just 6’5″, it’s one of the shortest power towers available (most power towers are 7′ or taller). That last point can be both a pro and a con. A pro because in addition to making it more stable, it’ll also be fine to have in a room with 8 foot ceilings (not so with taller power towers; you’ll hit your head when doing pull ups). A con because it means almost everyone will have to really bend their knees when doing pull ups, which some may find annoying. Moreover, really tall people – say 6’4″ and taller – will be able to reach the pull up bar from their knees, which effectively renders it useless for that exercise. Another potential drawback is the price. Bowflex equipment tends to be more expensive than the competition, and this power tower is no different – it will cost you more than a comparable power tower. That said, it’s significantly better than most of the competition. Who’s it not right for? Why is it top 5? Simply put, this is a good all-round power tower. It’s well-designed and built with strong, heavy steel and quality components. It’s also relatively inexpensive. It’s a strong and sturdy piece of equipment, which is due to the comparatively wide base (approx. 24″) and overall weight (95 lbs; 43 kgs). This means that you’ll get a good upper body and core calisthenics workout without being distracted by significant rocking or wobbling. 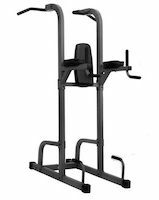 Also, unlike the Bowflex Body Tower above, the XR 10.9 stands at a good height (an even 7′), and even very tall people will be able to do good quality pull ups. That said, its wide base means the dip bars are further apart than many other power towers, and this can make dips a little uncomfortable for people with narrow shoulders. Also, the lower crossbar is in an awkward spot, and when using the vertical knee raise (VKR) station, you may hit your legs at first, which can get annoying. You will, however, quickly figure out the technique you need to use to prevent this from happening. 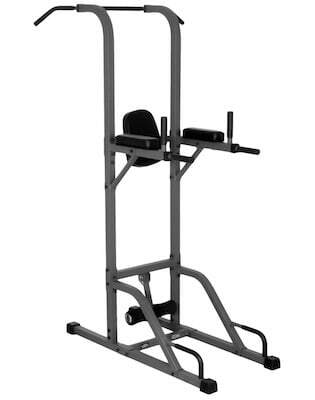 The XM-4432 Power Tower from Xmark Fitness is fairly unique in that on top of the usual pull up, dip, VKR, and push up stations, it also has a sit up station. This adds a bit of versatility to your abdominal workouts in that you can work your lower abs with your vertical knee / leg raises, and work your upper abs with the sit ups. It’s also nice and sturdy, and really easy to put together. 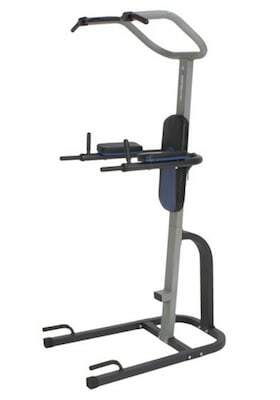 Let’s start with the cons this time: The XM-4432 is a fairly hefty power tower, meaning it’s going to take up a fair bit of room in your home workout space, and require a fair bit of open space on either side of it to be able to use comfortably. 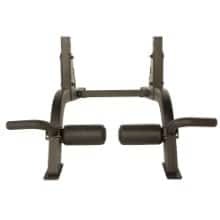 The dip bars are a little on the thin side, which makes them uncomfortable after prolonged use, and the pull up bar is quite close to the center, so you might find you hit your shins on the sit up station if you don’t keep your legs bent. These are minor issues, and you can fully expect to get used to them very quickly. Now for the pros: The size, weight, and high quality materials of this power tower (98 lbs; 45 kgs) actually make it very sturdy, and reduces the extent to which it moves during use. Only people over 220lbs (100 kgs) are likely to feel any wobble in this thing, and probably only when doing dips, and probably not much anyway. 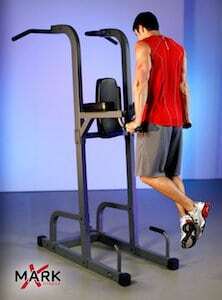 The pull up bar also stands a good 7’2″ off the ground, meaning it’s a solid option for those taller people among us. Xmark Fitness are well known for shipping their equipment neatly and securely, and for having very functional packaging. This is primarily what makes the XM-4432, and really all Xmark power towers, much quicker and easier to assemble than the other options out there. The design and quality of the Stamina 1700 is outstanding. 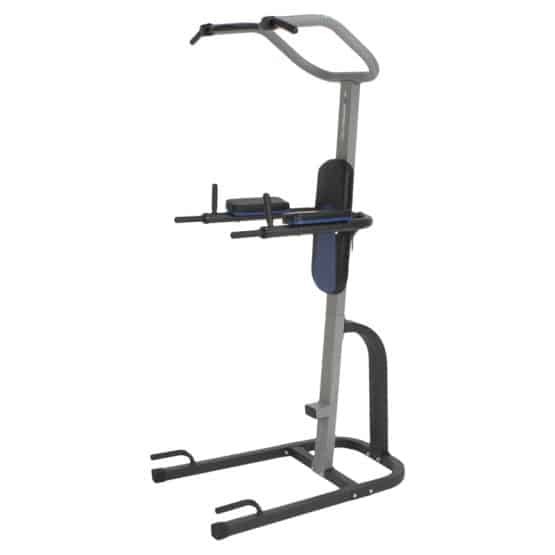 Stamina Products’ fitness equipment has a reputation for being well-constructed, and this power tower is good evidence of that. 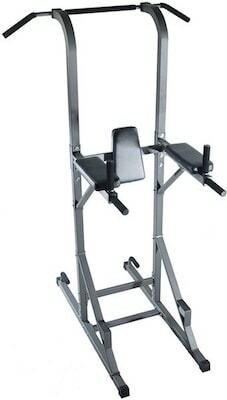 The Stamina 1700 is another power tower with a strong, durable, heavy frame. It weighs in at 93 lb (42 kgs), which means you should experience very little movement in it during use, unless you yourself are quite heavy (i.e., 200 lbs+; 100 kgs+). The components are also well-made, particularly the padded rests that make up the VKR station. 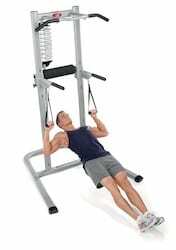 Many power towers seem to skimp on these components, which often makes vertical knee raises more difficult than needed. It’s got large footprint, which means you shouldn’t buy it unless you have a decent amount of room in which to use. The pull up bar is also 7’1″, meaning you’re going to need high ceilings or you’ll likely hit your head on your roof at the top of your pull ups. It’s not particularly well-packaged. The nuts and bolts often seem to be loose in the boxes, which can be a real pain when trying to assemble it. It’s quite a bit more expensive than most other similar power towers. It’s not as expensive as the Bowflex Body Tower, but it’s also not as good. That’s very easy to answer: It’s a good quality single-sided power tower that won’t cost you an arm and a leg. If you have a small workout space and a small budget, then this is probably your best option. Let’s start with the obvious; being a single-sided power tower means that it’s compact, and requires relatively little space in which to use it comfortably. But just being single-sided doesn’t really cut in the power tower game. There are number of other power towers out there that can sit hard-up against a wall or in a corner, why is this one worth considering over them? 1) It’s made from good quality, durable materials. Most of the other single-sided power towers have somewhat questionable constructions (the Bowflex is probably the only one better than the ProGear 275). 2) It has retractable dip bars. Yep, the dip bars fold up, which allows you to move them out of the way when you’re doing pull ups. 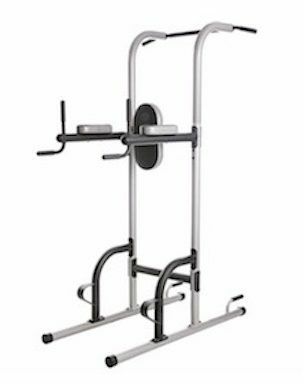 One of the most common drawbacks of single-siders is the dip bars getting in the way of good quality pull ups and only the ProGear and the Bowflex have solved this problem. 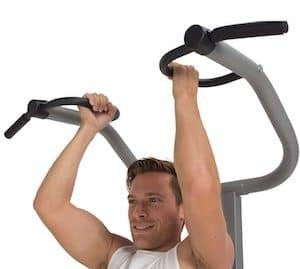 On the downside, the ProGear 275’s pull up bar doesn’t allow for narrow grip pull ups or chin ups. It has a ‘multi-grip’ design meaning it has a gap in the middle. There is a benefit to this design though. It means you won’t hit your head on the pull up bar while doing dips (because there’s a gap in the middle), and it allows you to do neutral grip pull ups, a function that is sorely lacking in many other power towers. 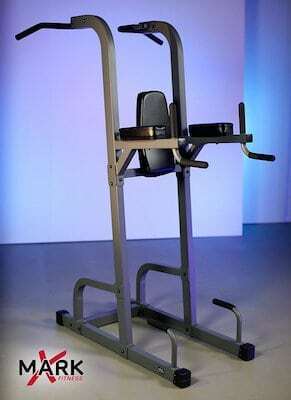 Also, the ProGear 275 has a weight capacity of 275 lbs, which is lower than most other towers. Okay, so that’s the 5 best power towers for the money. They’re all solid options depending on your specific characteristics, circumstances and preferences. If you’re determined to get a good piece of equipment for less than $300, odds are you’ll end up with one of them. That said, power towers are like a lot of products, especially fitness products: You get what you pay for. The fact of the matter is, if you want one of the best power towers overall, then you’re going to have to drop a bit of extra cash on it. Why is it the best overall? 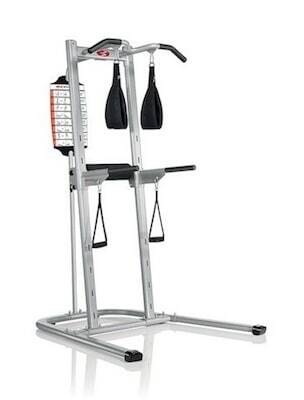 This power tower is what people mean they talk about “gym-quality” equipment. It’s the type of tower that many commercial gyms have, and we suspect many commercial gyms actually do have this exact one. 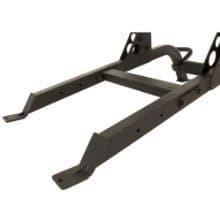 The 11-gauge, 2″ x 3″ powder-coated steel frame is extremely solid, and will be able to take an absolute beating. Also, all of the frame’s welds are high-quality; they don’t have any sharp edges, and don’t block any of the screw holes (this is a problem with some of the very low-quality power towers, which can make assembling them an absolute nightmare). The padded back and arm rests in the VKR station are 3″ thick high-density foam. Most other power towers only have 2″ foam. This makes the XM-7617’s VKR station as comfortable as it can be. The vinyl covering is also superior quality, and you’re unlikely to ever have to worry about it tearing or popping stitches. The rubber grips on all of the bars are also good quality, comfortable, and don’t get too slippery beneath sweaty hands. This power tower tops the scales at approximately 150 lbs (68 kgs), which gives it a degree of stability that the lower cost alternatives just can’t match. One of the things you should notice about this power tower compared to most others is that during dips and pull ups, it just feels rock solid. There is, however, one very minor drawback to the Xmark XM-7617: the dip bars are relatively close together. With a width of roughly 20.5″, these will potentially make some people with quite broad shoulders feel a little cramped during dips. Narrow dip bars are, however, preferable to overly wide bars, as they don’t place undue strain on the shoulder joints; they just feel a little awkward while you adjust to them. Why is it number 2? It was a close decision as to which power tower would get the nod for the number 1 position in our list. 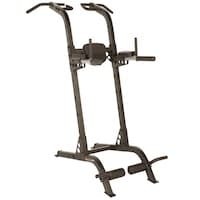 Even though the X Fortress is basically Stamina Products’ heavy duty response to the Bowflex Body Tower, it lost out to the Xmark XM-7617 for a few key reasons, which we’ll explain in detail below. Similar to the XM-7617 above, the Stamina X Fortress is just a good-quality, well-made piece of equipment. 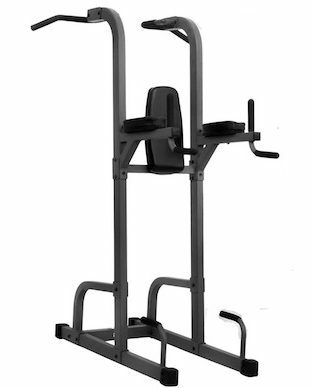 The frame is nice and strong, the components are all ergonomic and work as intended, and at 154 lbs (70 kgs) fully assembled, it’s a very sturdy power tower. 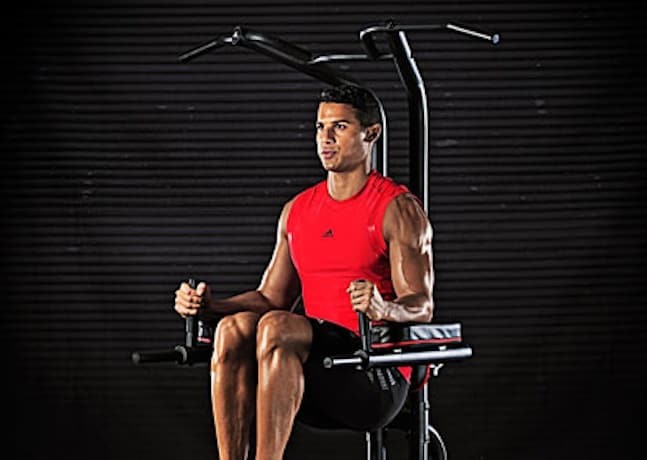 But the best thing about this power tower is, similar to the Bowflex Body Tower, the range of exercises you can do on it is absolutely brilliant. The plyo box attachment can be considered a little slice of genius, and provides an option for a true high-quality bodyweight leg workout (check out the video below to see the exercises you can do on it). The different pull up grip options are absolutely unique to this tower. Are you a rock-climber? Well, the Boulder Fit handholds can help you develop the finger strength that’ll have you stuck to those rock walls like glue. Similarly, the Stronghold grip attachments will help to build phenomenal grip strength. The adjustable dip bars are another great feature that very few power towers have. In the high position, they’re great dip bars (duh! ), in the middle position they’re perfect for inverted rows (an excellent exercise for the traps and posterior deltoids), and in the low position you can use them as push up platforms. So with all of these features, why didn’t it get the number 1 spot? Well, here’s the thing: all of the features are great, but they can end up feeling like a bit much. Plus, some of them turn out to not be very practical. For example, the Boulder Fit grip is really cool idea, but unless you are actually a rock-climbing enthusiast, there isn’t much point to them and they’re likely to go unused. Same with the Stronghold grips – good idea, but they can be annoying to take on and off and require a certain amount of grip strength to use in the first place. Again, you may find that you give them a go at first, and then end up putting them away, probably for good. 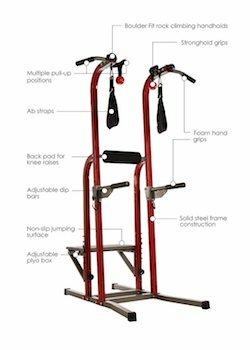 Don’t get us wrong, it’s a great power tower, and worth the money just for the quality of the frame and components, and versatility provided by the plyo box. But we just couldn’t go past the robust simplicity of the XM-7617. On top of that, the X Fortress only has a weight capacity of 250 lbs (113 kgs; unusually low for such a sturdy power tower) versus the 600 lbs (272 kgs) capacity of the Xmark. Why is it top 3? Apart from the fact that it just looks so beastly (we think it kind of looks like someone started making a mech warrior, and then decided to stop and make it a power tower instead), it’s an all-round great piece of equipment. Just like the two above, this heavy duty power tower from Paradigm Health and Wellness (makers of the Fitness Reality line of products) is extremely sturdy; extremely stable. 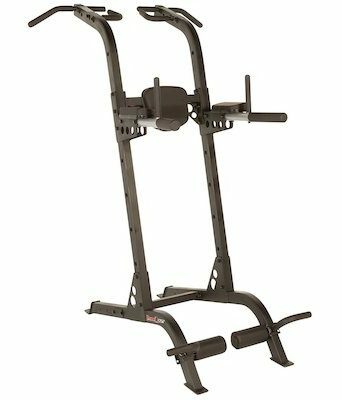 The frame is thick and strong, which will be obvious to you once you’ve finished assembling it and you’ve got a rock solid, 150 lb (68 kgs) hunk of steel sitting in your home gym. On that note, although it may look difficult to assemble, Paradigm are well-known for the high quality of their assembly instructions as well as the packaging that contains the necessary hardware (nuts, bolts, washers, etc.). You should have it together in about 60 – 75 minutes – less if you have someone helping you and you’re own socket set handy (and adjustable wrench x 2). 4 bolt holes for bolting to the ground: This is the only power tower we’ve come across to have this option, making it truly unique. Bolting it to the ground will make it as stable as it’s possible to be. All of that being said, this thing is pretty big, and will take up quite a lot of space in your home gym. Also, the raised legs on the base are supposed to be steps to help you into the VKR and dip station, but they can often just feel like trip hazards. Although these aren’t major drawbacks, they’re drawbacks nonetheless. So there you have it, the best power towers overall. Yes, they’re significantly more pricey than our best power towers for the money, but once you get over that initial ‘sticker shock’, we think you’ll realise that you’re getting a power tower that’ll probably outlast you, and will actually be money well spent. Bodyweight training is an absolute must for anyone who truly wants to realise their own extraordinary potential for physical movement. Consistent and dedicated bodyweight training produces amazing overall fitness results. In particular, the strength you’ll gain from correctly performed calisthenics transfers to all other forms of strength, including weight training. As we mentioned at the start of the article, you can do high quality bodyweight workouts with nothing but the floor; no equipment is needed. So, why then should you get a power tower? Because pull ups, dips, and knee raises are some of the most effective calisthenics exercises you can do, and a good power tower allows you to do all of these exercises (and often more) on the one piece of equipment. In the case of pull ups (and chin ups), there is no other exercise that works the major muscles of the back (i.e., latissimus dorsi and to a lesser extent the trapezius) as effectively. For less than the cost of one year’s gym membership, you can have a machine that’ll help you get a great calisthenics workout, day-in day-out, for years. What to Consider Before Buying a Power Tower? This is a question that goes unasked all too often. Power towers are great pieces of equipment, but because they come in very different shapes and sizes, if you don’t consider which one is right for you and your situation, then you might end up with something that gives you more of a headache than a workout. How much space and height do you have? Double-sided power towers will generally require about an 8′ x 10′ space in which to use them comfortably, while single-sided power towers will usually only need about 3 – 4 feet in front of them, and a couple of feet either side. The height of your ceilings is important as well. You’ll want at least 12″ of clearance above the pull up bar. Ultimately, when doing pull ups, you should be pulling your chest up to the bar rather than just trying sneak your chin over it. In that case 12″ may not even be enough. Most power towers are in the vicinity of 7′ tall, meaning you need 8′ ceilings or taller. As you will have seen from our reviews above, power towers range from fairly cheap to very expensive. The fairly cheap ones are usually $100 – $150, while the expensive ones are generally $350+. Although you do get what you pay for, whether or not you need an expensive one will be determined primarily by what you want to do with it, as well as your height and weight. Most power towers are only suitable for straightforward calisthenic workouts. 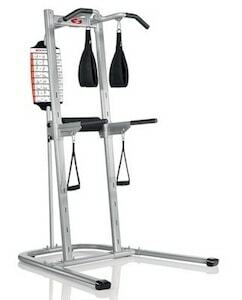 That is, controlled pull ups, dips and vertical knee raises, and platform push ups (some, like the Bowflex Body Tower and Stamina X Fortress allow you to do inverted rows, but these are fairly unique in that regard). 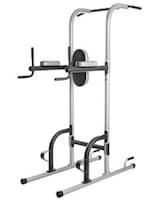 These free-standing pieces of equipment aren’t safe to do explosive bodyweight exercises on, such as kipping pull ups (crossfit pull ups) and front levers. If you wish to do these kinds of exercises, the only power tower that would be ok for this is the Fitness Reality X Class Power Tower, and only if you’re going to bolt it to the floor. Similarly, many people want to do weighted bodyweight exercises, such as dips and pull ups with a weighted vest or ankle weights on. These are fantastic exercises to help build serious strength and increase the number of unweighted reps you can do. The only power towers suitable for these kinds of exercises, however, are the Xmark XM-7617, and the Fitness Reality X Class because they’re the only ones sturdy enough, and with high enough weight capacities. What’s your height and weight? 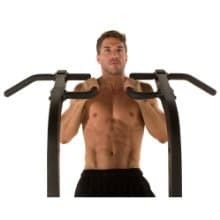 The reason for taking your height into consideration is that some power towers, the Bowflex Body Tower for example, have very short pull up bars (6’5″). If you’re over about 6’4″ you can reach the bar from your knees, and therefore you can’t do pull ups. Most power towers have pull up bars that are at or above 7′. If you’re tall, you must get one of these. Your weight is important because the heavier you are, the heavier your power tower will need to be in order for it to remain stable during use. 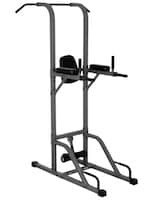 If you’re over about 220 lbs (100 kgs), we recommend that you get one of the heavy duty power towers we recommended, otherwise you’re going to have some serious issues with your equipment wobbling and shaking, especially while using the dip bars. What floors do you have? Although most power towers come with little rubber or foam feet on the bottom that are supposed to protect your floors, these tend not to be all that good, especially after you’ve been using your tower for a while. Therefore, if you’re planning on putting your power tower on some floor you want to protect, then we recommend you get some lightweight gym flooring to put beneath it. This protective foam flooring, for example. Ok, there you have it: Our recommendations for the Best Power Towers currently available. We hope that helped you decide which is the right piece of equipment for you and your home gym. If you did find it helpful, why not share it with your friends and / or family on social? As always, bets of luck with your home workouts. Remember: when it comes to your health and fitness, you can either make the effort or make excuses, but you can’t make both.